Brian Portelli is not a household name, and even after what he did in the Pecos League, it still might not register amongst watercooler conversations. Portelli’s college career began at Grand Rapids Community College before he transferred to Florida International where he never hit below .343. After going undrafted, he signed with the Southern Illinois Miners where he spent the better part of two seasons with them. He batted .233 over 71 games with six home runs and 28 RBI. 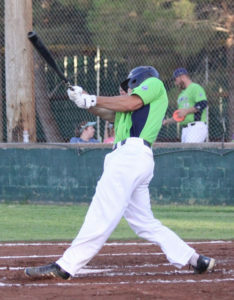 Over the course of four collegiate years and two in the Independent leagues, Portelli hit a grand total of 16 home runs, so what happened with the Roswell Invaders in 2018 is astonishing. His feats never went unnoticed either. Upon completion of the Pecos League campaign, he signed with the Ottawa Champions of the Can-Am League. In 60 games with the Invaders, Portelli led the league with 32 home runs, 114 RBI, and hit .423 which was good for second in the league. The Pecos League, more or less, the most unknown of the big 5 (Atlantic, American, CanAm, Frontier), is still hanging strong after starting in 2011. Despite playing in the shadows, Portelli isn’t the only player drumming up attention from the baseball world. Johnny Bladel, who hit .518 for the Trinidad Triggers in 2014, is currently in Double-A with the Boston Red Sox Organization. Bladel continued his streak of destroying baseballs in Indy ball for four more years before getting his shot, Portelli will need to do the same. Since joining the Champions, he’s struggled batting .200 after 18 games. It’s not an easy road, especially playing from behind, but anyone familiar with the game knows that the tides can turn after only one base hit.